This week, in Part III of my series, I’m going to discuss Delegation. Even kids can help the self-employed in a time-crunch! Okay, I need to confess something to all of you. I have a problem with… delegation, the act of entrusting another to MY work. That’s right. MY work. I like to maintain complete control of our business at all times. From A to Z (accounting to Zach), I am convinced that if I am not controlling everything simultaneously then things will definitely and completely fall apart. I recognized this problem long ago, and I know the stress my little control problem causes is probably slowly killing me. But, I was always afraid to turn over my tasks to another person. And, it seemed the time it would take to train someone to do it would just take up even more time that I did not have! Over the summer, our business boomed and it got to the point where I had to finally say, “No more!” My breaking point turned out to be a blessing. Author Care – From discussing our services with authors who were considering us, to vetting and approving or rejecting incoming manuscripts, to accepting new authors, processing their new orders, ordering their covers, formatting their books, helping them if they submitted their own covers, to questions about marketing, royalties, Ingram, Amazon, etc., etc. Booklocker – While Richard, Matt and Zach did the majority of the website work, I had a great deal of contact with customers, participated in online discussions, talked to the press, negotiated deals with other companies, came up with marketing ideas, wrote verbiage for sales, made minor changes to the site, and more. 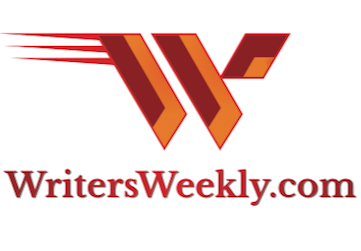 WritersWeekly – I not only worked with our freelancers, but I also wrote/edited and organized the entire issue each week, including finding all the jobs and compiling the market listings. Zach/Richard would take my gigantic text file each week and transfer it to the website as well as format it into the email issue. I was also doing all the Whispers and Warnings investigations and correspondence, as well as fielding the inevitable threats coming in from deadbeats and having discussions with our attorney. Finally, I answer numerous questions about writing and publishing for our readers via email every single day. The Write Markets Report – Or monthly subscription-based publication. I was researching, writing and formatting every monthly issue in its entirety all by myself. Paperwork – I hate paperwork! I opened and processed all the mail, from bills to book reviews to orders from the public and bookstores. Yuck! I really hated that. Family – I was still nursing Mason full-time (still am!) and trying to spend as much time as possible with the family, though Richard had long since taken over most of the cooking and cleaning because there was just no way I could help with any of that. I bathed Mason and Max each night and was adamant that I keep that task because they love bath time and that’s fun-time I get to have with them. I also read to them at night and they are always able to cuddle up next to me when I’m working (I work in our bedroom). As the business grew and grew and grew, something had to give… and that meant me giving work to other people. Ack! What if somebody did something like… make a mistake? How would we survive?! At Richard’s gentle urging, the first thing I did was look at what I did that I liked the least. Accounting and paperwork. Blech! Matt works for us and is in college. He wants to be an actuary someday (somebody who computes numbers and risk for insurance companies). He’s really good with numbers! I immediately (yet hesitantly) went to work training him to use our accounting program. He was very happy to have something new to learn. From printing royalty checks to paying the regular bills to reconciling bank statements, he was doing almost all of it in no time at all. He also took it a step further and started sorting the mail. 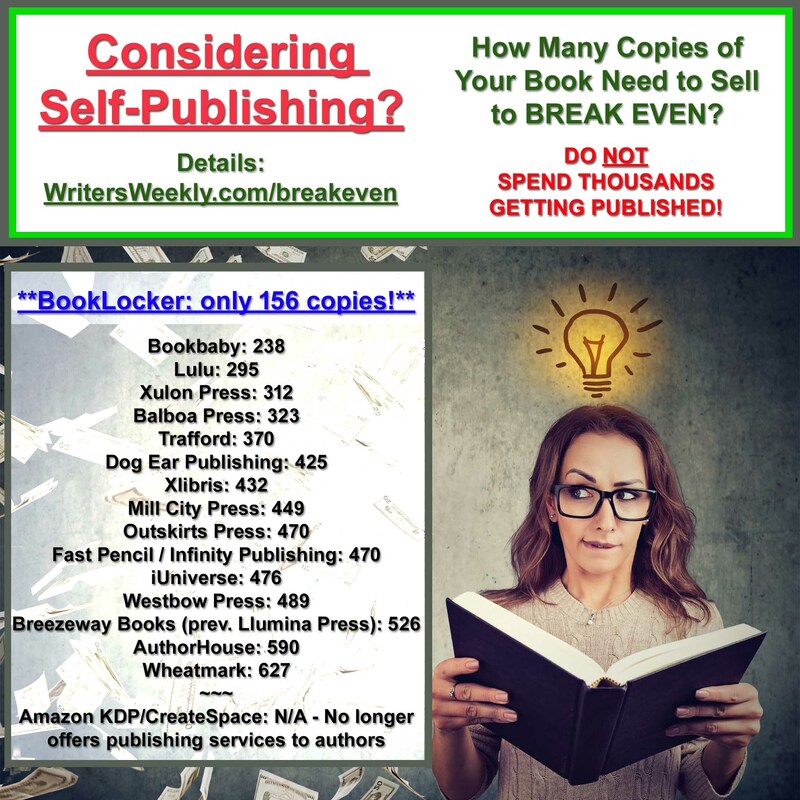 I taught him how to process orders that arrive by mail, how to manually credit royalties to author accounts for those orders, how to recognize fake bills (“you’re running low on printer ink!”) from real ones, what accounts to code things to – no detailed tidbit was left unexplained. After a few days of having the paperwork off my plate and the accounting being done by someone else, I was thrilled to discover that letting all of that go did not kill me and our bank account did not implode! A few weeks after that, I even started letting Richard approve the checks Matt was sending out and, a few weeks after that (baby steps! ), I turned over the cash flow statements and projections to him! Richard actually likes to do forecasting and spreadsheets and stuff so I’m kicking myself for not putting all that on his plate years ago. After all that, I was still terribly backed up and still working after the children were in bed most nights. I get really depressed when everybody else gets to sit around and watch TV at night or sit outside by the river, or play in the yard, and then eventually shower and go to bed…while I’m still pounding away on my computer. The next thing I did was train Ali (age 16) to send out questionnaires to magazine editors using a form Richard created on our server. The magazine editors complete the questionnaire, Ali uses their answers to create their market listing for writers (for The Write Markets Report and eventually WritersWeekly), sends it to me for approval, and I then send it to each editor. I haven’t yet trained Ali to format The Write Markets Report but that’s next on my list for her. Oh, and Matt taught Ali how to reconcile our personal bank statements in our personal accounting program so she’s doing personal work for us, too (which means she gets paychecks from us and from the business). And, at age 16, it was definitely time for her to learn how to reconcile a bank statement! Richard then taught her how to print checks in the program and she is enjoying that as well. We started enlisting Frank’s help with babysitting. He gets paid by the hour to babysit when we’re in a crunch and he babysits one night a week when Richard and I have our weekly date. Frank is also really good at fixing stuff. If something breaks, call Frank. He installed a new toilet seat on Sunday and he was instrumental in helping Richard build our Halloween Pumpkin People! It really is nice to have someone that handy around the house. We hired Alyssa, Zach’s girlfriend, to help around the house. I put her in charge of “Clutter Control.” I told her up front that I did not have time to tell her where everything goes. I said, “Just pretend you live here. Put stuff where you’d put it if you lived here. If I can’t find something, I’ll just have to hunt for it.” We’re no longer stepping on Legos on the way to the bathroom at night, our clean laundry now just magically appears (all folded and everything! ), the dishes are always done, and, if we’re good, we sometimes find homemade cheesecake or chocolate chip cookies on our kitchen counter! Oh my gosh, it’s like a fairy lives here! What did we EVER do before Alyssa?! She is also excellent with the boys. Max and Mason adore her! I still insist on being the main contact with all authors, and will always be the main contact. I will not have a line of reps in some third-world country (or even our country!) blindly answering phones and emails and treating authors like numbers. Our authors deserve to have one contact at Booklocker.com and the owner is the best contact. Nobody cares about the company and customers like the owner does! That said, I really needed some help with book formatting. Yes, I was formatting and converting all the books we were publishing, except the very rare color-interior book (which our designer was formatting) or the very rare author-formatted pdf file. So, just last month, I finally broke down and taught Zach how to format books. To my utter surprise, Zach LOVES formatting books! And, heaven knows, we have plenty of them to do! So, I send him the first version of the book. He formats it, sends it to me for corrections and tweaking, and then I send it back to the author for any final changes. When it comes back, I check it one more time, convert it to pdf, and then send that to the author and help them finalize everything. I also taught Zach how to put the pieces of covers together (if an author submits a front, back and spine or just a front and back and can’t figure out the spine), and how to take a cover submitted by an author and place it on the printer’s template, how to position the barcode, etc. He really likes doing that, too. It’s a creative process and putting the pieces together is not only pretty easy, but it’s pretty fun, too. Training Zach to format books has saved me a ton of time – several hours a week – and I realized a couple of weeks ago that I was no longer working until 2:00 or 3:00 a.m. most nights. And, guess what? The world did not come to an end when Zach started formatting books! I still compile, create, and edit WritersWeekly.com each week. In fact, I’m writing this article on Wednesday morning and it’s (ug!) 1:25 a.m. right now. But, this is unusual. I’m behind because I took most of Monday off. Richard’s dad was in town, visiting from Texas. And then I kinda procrastinated on writing my article until now. I also remain the main contact for WritersWeekly University but I’m going to turn that over to Richard soon. We needed some material from an instructor a couple of weeks ago and I put Richard on the hunt for it and it all came together without me and the world once again did not end! 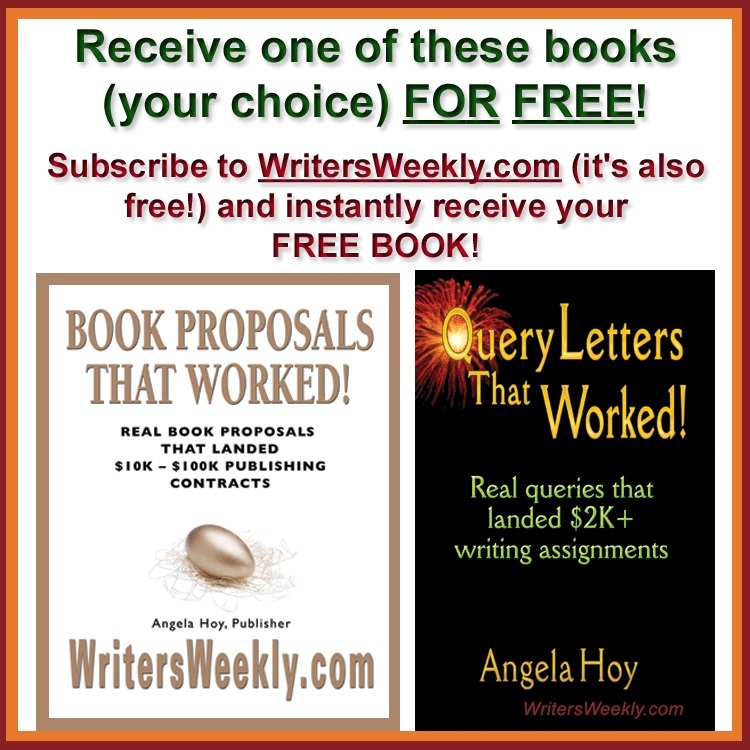 So, if you have an idea for a class for WritersWeekly University (we pay 70% commissions! 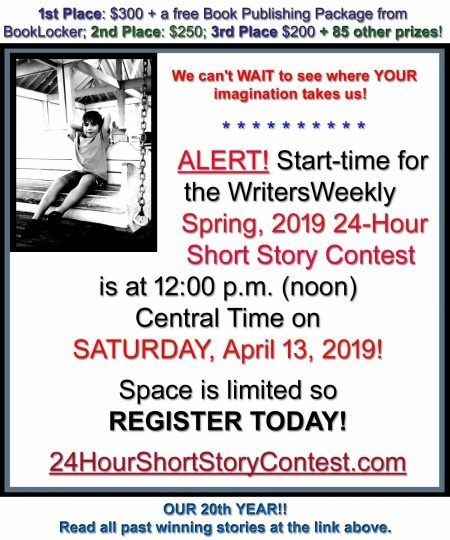 ), contact richard – at – writersweekly.com. Tell him I sent you. Ha ha! I still get all incoming manuscripts and I am usually the one who decides to accept or reject each incoming manuscript. This is just too important to delegate to another. From accidentally publishing a book that could result in a lawsuit (boy-on-boy, those tell-all books are just lawsuits waiting to happen! ), to reviewing each manuscript for salability and quality, there is too much at stake for this task to be trusted to anyone but myself and Richard. He prefers I handle this area and I’m happy to keep this part of my job to myself. And, gosh, if I didn’t do this myself, how would I ever get the material for my popular “World’s Worst Book Proposals” columns?! Sure, we still have our days and even our weeks where things get a bit frantic. If we run a sale on setup fees or books, we get slammed. We plan those sales for specific times, like months we know new book submissions will be slow (August and December – don’t ask me why – happens every year) or times when there is a lull in book sales (July and August) or times when we want to encourage authors to order early to avoid the holiday rush (we’re running a sales this week to encourage authors to order copies before Thanksgiving as opposed to after, when things will REALLY get hairy). We realized last week that this is WritersWeekly.com’s 10th year! Ten whole years! Where has the time gone? I am kicking myself for not learning the fine art of delegating long ago. It would have definitely saved me so much time and stress over the past few years. I’m glad I finally listened to Richard and pushed some stuff off of my desk and onto somebody else’s! If you feel like you’re constantly buried under a mound of emails and paper, make a list of the general things you do each day. Break those items down into smaller lists and figure out which tasks you can delegate to others. Even if a task seems small to you, if you take a dozen small tasks and divvy them out to others, that can mean a significant change in your schedule and stress level in the long-run! Don’t want or can’t afford to hire someone to help? Why not put your computer to work for you? Next week, we’ll discuss Automation.